14-year old Military Kid, Emily Sanborn was my guest on The Mindset Mechanic Show. She talked about moving from North Carolina to Germany, what she wished she had packed in the express shipment, and how she makes new friends quickly. Listen via the link below! Summer is the moving season for military families. So we brought in an expert to talk about how to do well when you're a military kids who has one more opportunity to move again, make new friends again, and adjust to a new school again. Hear Tori Baker's interview on The Mindset Mechanic Show by clicking on the link below! 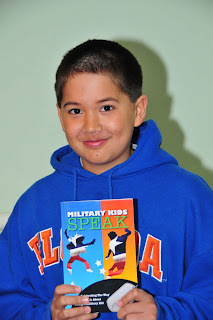 If you're a military kid who would like to share your wisdom to help other military kids by being interviewed on the radio, send an e-mail to Julie@militarykidsspeak.com. Include your name, age, where you live, e-mail address, and telephone number. 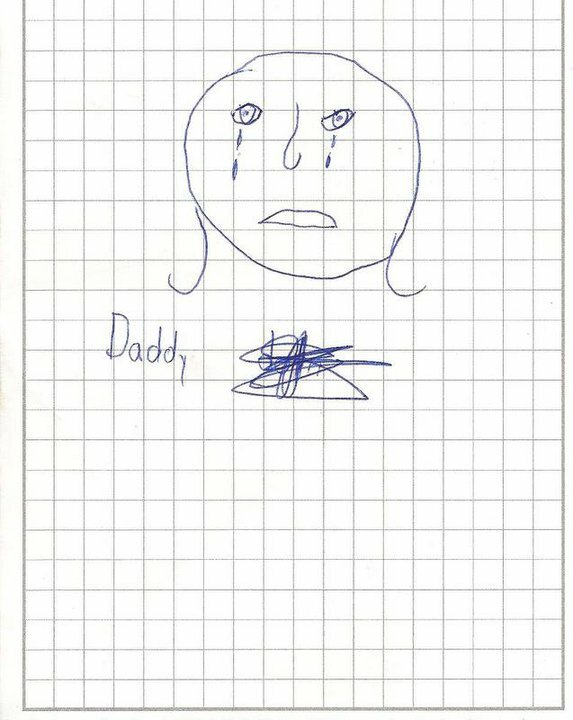 My life as a military kid has been difficult. Ever since I can remember, our family has been moving around the world. One of the hardest difficulties has been making new friends at a new base. My cousins live in Hastings, Nebraska, and have since they were three years old. They don't have the same challenges as a military kid does at meeting new friends. Although it has been a hard life, it has been an adventurous life as well. Here are some of the experiences I have been through as a military kid. When I was a baby about two years old, my parents and I were stationed in Korea. While we were there, I was a model for Elle magazine and I made the cover of the magazine. My cousins will never have that opportunity of modeling in Korea. That is just one opportunity that military kids have. Now let me take you on some of my experiences at Ellsworth Air Force Base, South Dakota. My other cousins also lived in South Dakota, so they had the opportunity to go to the same school since their mom is in the military. Avery, the youngest of the cousins, was in the same grade as me, so she was in my preschool classroom. We lived in South Dakota for four years. While I was in South Dakota, I met a girl named Maddie Sinks. She is still one of my good friends today. From that I have learned that when I move from base to base, I am able to keep in contact with all of my good friends. Our next journey is to a wonderful place called Whiteman Air Force Base Missouri. Missouri has been my most favorite base I have been to, since that was where my brother and I were born. We lived in Missouri for almost six years. 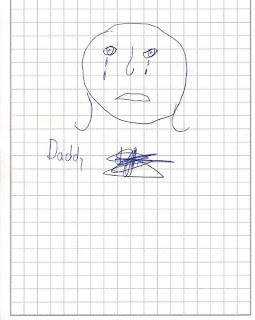 While we were there we found out that my dad had to deploy to Iraq. Our family was devastated because we were not going to see him for about four months. Imagine having one of your family members not there to tuck you in at night or to be there to help you out of your problems that the other parent does not understand. It is the worst feeling a military kid could have. While he was away, my mom and I talked to him on the phone and on the webcam, but it was not the same as talking to him one on one. Before my dad left, we found out that my mom was pregnant with a baby boy. We were all excited, especially me, because I was an only child for nine years. Four months later, my mom and I went to get my dad from the airport. That was the best feeling knowing that my dad was home safe and sound. Thank goodness that he wasn't hurt or injured. On account of my dad's deployment, I am more responsible because I had to take care of my mom. I had to make sure she had healthy food and that she got enough exercise. Not too long after my dad got back from Iraq, we got orders to Sigonella, Italy. I will never forget the day that all of the movers came to pack up all our stuff. We were all nervous and sad to leave all of our family and friends and move across the world. It took us two days when we missed our plane and lost our entire luggage in Chicago. Then finally, we got to Italy. When I first got to Italy, it was very different culture. I came from homemade fried chicken to pizza and pastas. When I got here, it was the summer of 2009. I tried to get involved in some activities here so I could meet some friends before school started in September. When school finally started, I was nervous because I only knew about seven people. Being a military kid is very difficult sometimes, but it has its advantages too, like not very many people get to say they have lived in Italy. All of my life I have lived on a base surrounded by a fence and a lot of gate guards. When my dad retires, I will no longer be a military kid, but I can say I once was a military kid that lived all around the world. Kaylee Holland was born in Warrensburg, Missouri, on a Saturday. She is currently living in Sigonella, Italy and her father is in the United States Air Force. Kaylee has moved all around the world her whole life. She has two wonderful parents that love her dearly. She also has a cute baby brother who is two years old. She was an only child for nine years, but is now thankful to have a brother. Kaylee is twelve years old and in the sixth grade. She has lived in Italy for seven months, but can't wait to move back to the USA. Kaylee has great friends and will be sad to leave them in three years. She is a very strong Christian and serves the Lord with all her heart. She goes to youth group every Wednesday night and learns more about His word. Kaylee has always been tall for her age. That has helped her in sports and in other activities. Some of her favorite things to do are hanging out with her family, reading good books, and running track. Kaylee won her first track meet at the age of seven. She continued to be in the yearly track meets where she took first in every event that she competed in. She is praying that someday she will be in the track Olympics and win many gold metals. How could you describe this military girl? You would start with the fact that Junavy Frianeza has a creative mind. She likes to sit in her room and listen to music depending on her mood. Junavy might listen to rock music, pop music, or even country music if she wants to. Reading is one of Junavy's favorite things to do. This bookworm reads from all kinds of genres whether it be fantasy, adventure, science fiction, even nonfiction, which she tends to stay away from. Her favorite books of all time, so far, would have to be the Twilight Saga by Stephenie Meyer, which she has re-read a couple times. This imaginative girl can sometimes be spotted inventing her own random story. She has lived in Japan, Washington State, and currently lives in Sigonella, Italy. 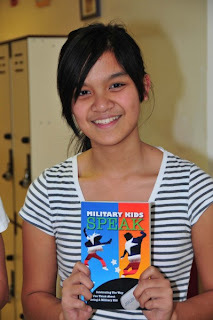 Junavy goes to school at Sigonella MS/HS as a seventh grader and likes hanging out with her friends. She also likes ... chocolate! When Junavy grows up, she plans to make a difference in the world, like her dad, and be in the Navy. Beatrice Greeson is currently living at Naval Air Station Sigonella in Sicily with her mother, father, brother and two hateful cats, Tinkerbell and Stella. She loves to read and swim, preferably at the same time. This avid reader devours just about anything she can get her eyes on. Beatrice spends too much time swimming for the base swim team, which competes all over Europe. She has traveled to many different countries and cities in Europe. Her favorite location across the pond is London, England, where she has been spotted exploring everything from cool vintage shops to plays at the Bard's Theater. Beatrice loves fresh white bread and potatoes of any kind (baked, mashed, sweet with marshmallows). Her favorite color is teal, especially when it is accented with gold. Reluctantly playing the clarinet for the past two years, Beatrice would kill to play the oboe. This petite military chick can be found in her cluttered room singing or writing stories and poems for an anthology of her writings she plans to publish. Being a military child can be tough. Making a difference in the community is something each person in the military does. You can do it, too! Making a difference in the community is something I not only enjoy doing, but it is also something that can relieve stress. I like to make a difference by raising money for the Leukemia and Lymphoma Society. I am the 2009 Honorary Youth Candidate of the Year. This job of being the 2009 Honorary Youth Candidate required me to raise money, collect donations, auction items, and do different types of fundraisers. As a result of all my hard work I put into the fund raiser, I went to a dinner at the Skirvin Hotel and was able to take my friends and individuals that have made a difference in my life. These people included my three closest friends, my Mom, Grandma, two of my Grandma's friends, and my fifth grade homeroom teacher. I received a gift from my teacher. It was a Willow Tree figurine and was very neat. My Dad was not able to make it due to being stationed at Fort Leavenworth for a school that he had to complete for the Army. Helping your community is not only good for everyone involved, it is also good for you. You learn responsibility and many other things. I believe that my parents have raised me to help the community in any way possible. My Dad helps fight for the freedom of our country and I want to help my community, too. In 2008, I raised over two thousand dollars for The Leukemia and Lymphoma Society. I would encourage everybody, military children or not, to find a cause they like and fully support it. Helping makes you a better person. If you join a cause, be prepared to fully participate. Do not start and quit in the middle. It is a task that can take up a lot of your spare time. You want to put forth your best effort with the intent of helping others. It gives you satisfaction that you did something good for your community. My favorite part about helping the community is the feeling that you have helped to improve it for the better. 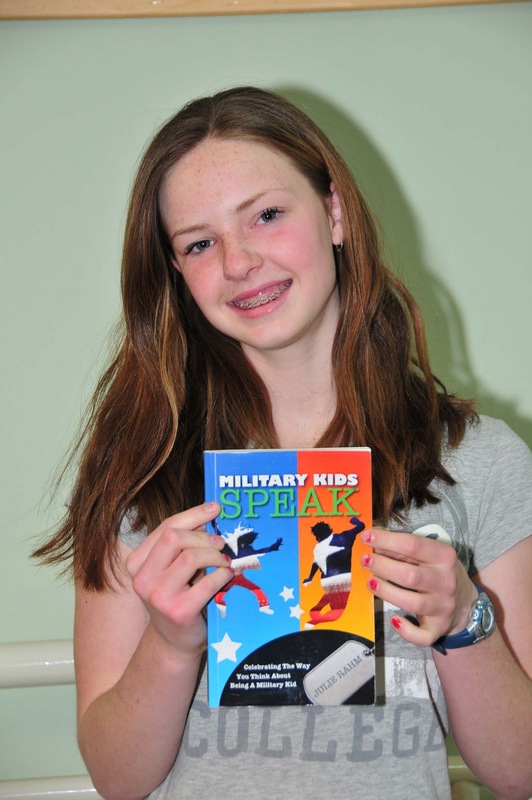 As a military child, giving back is just one trait that I have and am very proud of it. By serving your community, you could save someone's life and I consider that an honor. The world can be a better place just by doing one small thing. You do not have to do many great big things, but you can do one small act of kindness and might make an impact on someone's life. In order to be good at helping, you need to be fully committed and ready to serve. It is tough work, but it is definitely worth the work and time. Loving what you are doing is also very important. If you do not fully understand and get what you are doing, you won't ever reach your full potential. It doesn't matter your color, height, weight, age, history, or anything else. You can help! Lauren Anderson was born May 8, 1998 in Bambergl Germany. Her father is a US Army Field Artillery Officer and her mother is a stay-at-home mom. She is the oldest of three girls. Lauren is an athlete having competed in gymnastics, played soccer, as well as currently playing competitive basketball. Her team traveled to Walt Disney World in the summer of 2009 for the AAU National Championship where they placed 13th. Lauren has also received the "Best Team Player” award from Oklahoma Christian University’s basketball Cage Camp. Lauren excels in her academic studies, having always had a straight A average. Lauren received the Presidential Award for academic excellence as well as being nominated for the Masonic Award. Lauren is currently in sixth grade and serves on her student council at school. Lauren’s faith is very important to her. She enjoys attending church regularly as well as the many activities that her youth group does. Lauren hopes to attend Massachusetts Institute of Technology to study chemistry.